Here is the latest flyer for this summer's Druid Camp, which is taking place from Wednesday 3 August to Sunday 7 August on a hill overlooking the River Severn. I'm giving the event a bit of a plug because I'm going to be there and it would be lovely to meet up with some of the people who read my blog. Philip Shallcrass, Graham Harvey, Robin Herne and Joanna Vanderhoven are among those who going to be giving talks or workshops. Music and other entertainment will be provided by Mad Magdalen, Dawn Morgan, Kris Hughes, Penny Billington, Morrigan's Path and Square Bomb plus the headline act Space Ritual. As well as healing and craft areas there will be a new divination drop-in cafe, where I am going to be one of the people offering things like tarot readings and scrying. Other activities include dance, mead-making, drumming and chanting. 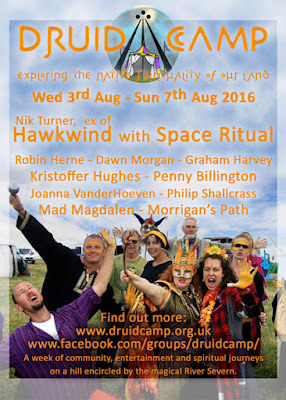 This year's camp will be at a dark moon and there will be appropriate ritual and magic.